When maximizing Command Prompt (Cmd.exe) window in Windows Vista, Windows 7, Windows 8 and Windows 8.1, by default the width of the Command Window will not extend to cover the full width of the desktop screen horizontally, leaving space to the right side of the window showing the desktop background. And worse thing is, users unable to drag and expand the size of Command Prompt window horizontally and vertically manually too. The issue is caused by restriction on size of Command Prompt window layout implemented by Windows 8.1, Windows 8, Windows 7 and Windows Vista. By modifying the window size setting for Command Prompt, users can fully maximize the window to occupy the whole desktop area or monitor screen using trick below. 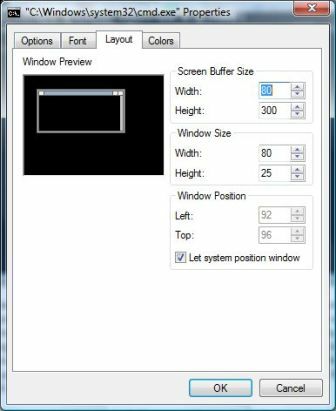 The maximum width and height or width of the Command Window is restricted by “Screen Buffer Size” parameter setting, which represent the text or line that can hold in the memory to display on console screen. By default, Windows sets the Screen Buffer Size of 80 for width and 300 for height. The width is the number of character cells in each row, and the height is the number of rows. Depending on the font size, which again by default is 8 pixels per character and 12 pixels per row, the screen with width resolution of 640 will get the fully maximized Command Prompt window that fill whole of desktop or screen. 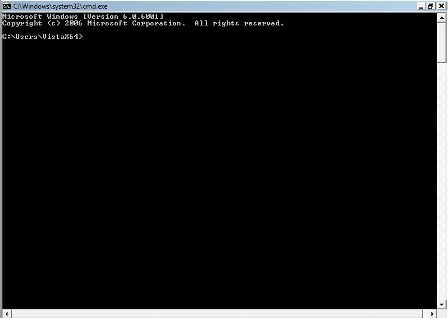 Thus, to increase the size of Command Prompt window in Windows 8.1, Windows 8, Windows 7 or Windows Vista, open a Command Prompt window, then right click on the window’s title bar. Select “Properties” and then click on “Layout” tab. Increase the size of Width value of “Screen Buffer Size”. To get a exact amount to fill the desktop length, divide the width of screen resolution by 8, assuming no change in default font size of 8×12 (in Font tab). Thus, the optimal width value for Screen Buffer Size for resolution of 800×600 is 100, 1024×768 is 128 and 1280×1024 is 160. There is no problem and no harm to set much higher figure for width and height (which at 300 default value is already exceeding the almost all possible screen resolution). With such setting, the Command Prompt window will have horizontal and/or vertical scroll-bar, and if the line of text is too long, you will have to scroll to left and right and/or up and down to see the full text. Thus if you dislike the vertical scroll bar, reduce the Height value of the buffer size. Once changed, minimize and maximize the command window again, and now it’s possible to put Command Prompt window in maximized position, and users can now also resize the window to any size and shape they prefer, as long as within the limit of the buffer size. 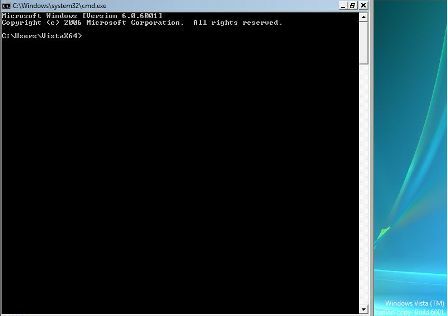 By the way, this is not the way to open Command Prompt in full screen mode. If you prefer to run Command Prompt in full screen mode, check out workarounds to open full screen Command Prompt window.